I have always, always loved this quote and it felt like a very appropriate one for the start of a new year. Basically it's about taking chances - you won't succeed if you don't try, but you might if you do. As there are a lot of things I want to try this year, I thought this one would be a great reminder of me to keep having a go at things even when it might seem too difficult or time-consuming. It will of course mean that I end up with a completely jam-packed life with doing all these things on top of blogging, planning the wedding, working full-time and potentially buying a flat, but I'm prepared for a year of no sleep if it means I can make a go of this! It's also a reminder of how far I've come - I used to look at bloggers with hundreds of followers and think I'd never get there, or that I wouldn't be able to write good posts and keep my own voice, but as I write this I've reached nearly 100 followers and now feel I'm able to make a go of my blog. I look back at my older posts and can see I've come on leaps and bounds in both being able to write comprehensively about my topic - especially on my beauty reviews - and to stay true to who I am. In terms of how it will inspire others, I hope it'll mainly work in the same way - that it inspires you, my lovely readers, to keep trying new things and to take chances, because you don't know what good might come of them. Whether that's trying a lip colour you wouldn't normally pick up or writing about something totally different from usual, I hope it inspires you to do something different in 2014. I know I have plenty of things I want to try this year, from learning to drive to writing more fashion posts and even having a go at vlogging, and I'm really excited about finally giving those a go - because, after all, you won't know what you can do if you don't try. Are you doing the #2014BloggerChallenge? What's your inspiration this new year? 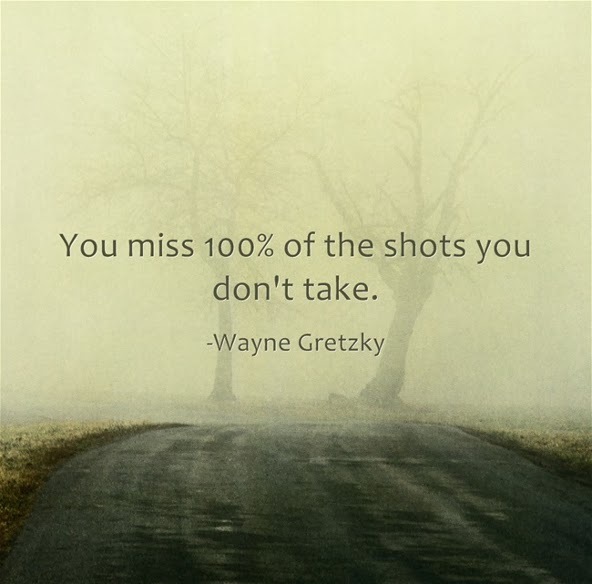 I love this quote too and really do believe in taking risks and trying new things. A lot of my 2014 is going to be about starting some new activities and trying to push my boundaries a little bit to explore things that I wouldn't usually do.